There are a great many gardeners out there in all levels of experience, some have been growing flowers their entire lives, some went to college and have earned degrees on the subject, while others are new to the art and just grow for fun. How many of them actually understand the science behind what makes flowers grow? We all know it takes sunlight and water and good soil, but there is so much more to it…so that brings us to the question, how do flowers grow? 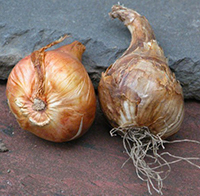 There are two classifications of plants, they are either a non-flowering or flowering variety. The flowering varieties are obviously the most identifiable with their colorful blooms. The non-flowering type of plants would be the various shrubs and coniferous trees, for example spruce and pine trees. Most plants go through a very similar process when it comes to reproduction in the sense that all have both female and male organs. The plant's pollen from the male part then fertilizes the female part and from there the seed is formed. 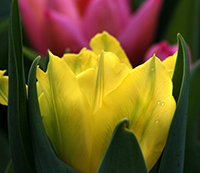 The reproductive system of a flower contains two essential parts that are tubular. In the center of the flower you will see the opening to the female parts called the stigma. Surrounding the stigma you will see the male parts called the stamen and these are where the pollen forms. When the pollen falls into the stigma through various means of pollination, it is transported to the plant's ovary where fertilization occurs and seeds are created. There are a couple different ways plants can be pollinated. The most common way is through insect such as bees. 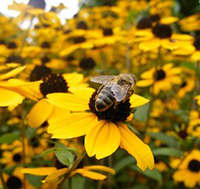 The bees land on flowers in order to collect its nectar for use in their hives. As a result of this collection process, the pollen will stick to the hairy legs and body of the bee. When the bee travels to the next flower, the pollen falls off and then fertilizes the next flower. Another method of fertilization is through the wind and many trees and plants rely on this method. The pollen itself is very small and extremely light, making it easily blown about on a windy day. When the pollen finds its way to other plants, it also fertilizes them this way. Now that you understand how the seeds themselves are formed, that is only the starting point of the plant's life cycle. Each one of those seeds has the potential to start another plant, but they first have to get out of the plant and into the ground so they can germinate. Once a plant blooms and produces seeds, that is typically the end of its life cycle for that growing season. The blooms will eventually wither and fall off, along with the seeds. Many plants typically reseed themselves at or near the site of the parent plant; however there are other ways that seeds can spread. The wind can also play an important role here as well, picking up the light seeds and blowing them to different locations where they might germinate and grow. Birds frequently eat flower seeds and as they are flying away they drop them into new locations. Animals that survive by eating plants will also feed on the seeds but may not digest them and later on deposit the seeds in a new location through their feces. Most often however the plant will die or go dormant, and simply drop its seeds around its current location. These seeds typically will go dormant over the winter and germinate the following spring when the weather warms. So now we have covered how do flowers grow and create their seeds, but how does a big plant grow from that tiny little seed? Well the answer might surprise you because many of the same basic ingredients that allow plants to grow are the same ingredients many other life forms on our plant require. 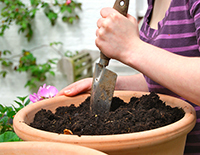 Plants draw their vitamins and minerals from the soil in which they grow. They also require water and lots of sunlight for their survival. When the seeds come out of their dormancy, the water will soften up their hard outer shell and the little embryo inside starts to grow. Where humans and animals require food, plants convert sunlight into energy through photosynthesis. As the plant emerges from its shell, small roots as fine as hairs will grow into the ground, while the little green seedling sprouts up out of the soil. As each new set of leaves sprout, the plant will get bigger and stronger, and the roots will go deeper. More nutrients are absorbed from the soil and more sunlight is converted through all the new leaves. This process continues throughout the plant's entire life cycle. 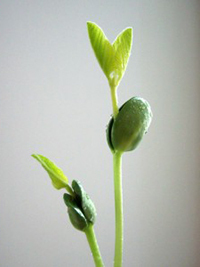 One of the best ways to discover how do flowers grow is to sprout some seeds yourself. There are a couple easy ways you can do this. The most obvious is to pick up a seed packet from your local garden center and plant them in your garden and watch them grow. But what if you want to see the growth steps up close? You can get seeds to sprout with nothing more than a paper cup and some cotton balls. Run several cotton balls under the faucet until they are completely soaked, then place them into the bottom of the cup. Put a couple seeds on top of the cotton, and cover them with a few more balls that have also been soaked. Set the cup on a sunny windowsill and over the next week make sure the cotton stays wet. It won't be long before you will see your seeds sprout and you can then watch them grow through the early stages of their life. Discovering how do flowers grow can be fun and exciting for the entire family.